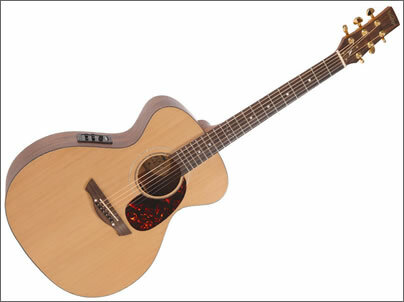 Vintage Guitars have announced the launch of the Vintage Gordon Giltrap Signature electro acoustic guitar. Highly regarded as one of the worlds greatest acoustic guitar players, Gordon has been at the forefront of acoustic playing since the late 1960’s and has released more than thirty albums in his four decades in the music business. Designed in conjunction with respected master luthier Rob Armstrong and Gordon himself, this crossover Grand Auditorium/000 style Vintage electro-acousticis based on a hand-crafted instrument that Rob made back in 1980 and Gordon plays today.Featuring a high grade solid North American cedar top, with mahogany back and sides the signature “small waist” body is complemented by Rob Armstrong’s trademark headstock design. The bridge is high grade rosewood, with a gradually compensated natural bone saddle providing excellent intonation,whilst the mahogany neck comes with a top quality rosewood fingerboard, with genuine abalone inlays and side dot markers. Electrics are provided via a FishmanÂ® Presys Blend preamp and Sonicore pickup system, which features a built in-microphone with mic blend control, notch – anti feedback control, phase control button, three band EQ and volume control, as well as a built-in guitar tuner with flip-top easy battery access. Gordon’s signature guitar is also being made available as a twelve string instrument with the same specification.